This Zendesk sidebar app gathers device information from Jamf Pro based on email from submitted ticket. If an iOS or macOS device is found based on email in ticket and email assigned in Jamf Pro, the device information will display in the sidebar. If no devices or multiple devices are found, you will be prompted with a search bar to gather information based on a chosen search term and dropdown list. Please submit bug reports to Issues. Pull requests are welcome. 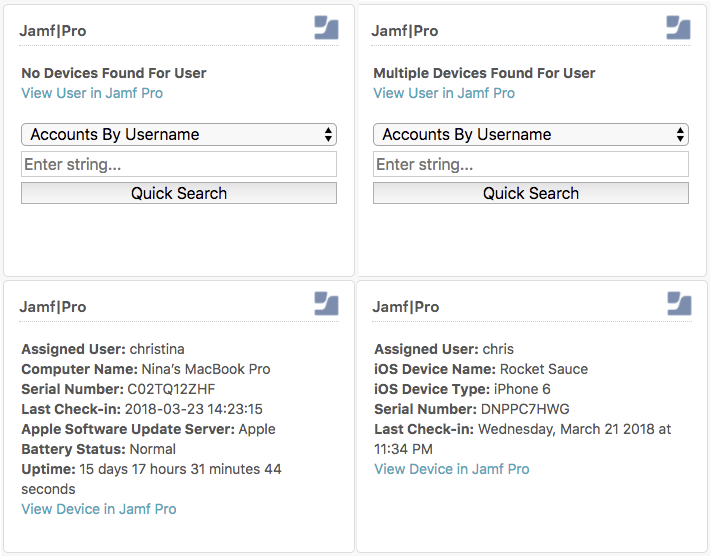 If user has multiple devices, a hotlink taking you to that user in Jamf Pro will show. Along with a quick search tool to GET a return from Jamf Pro API.